Like in minecraft to make a friend? 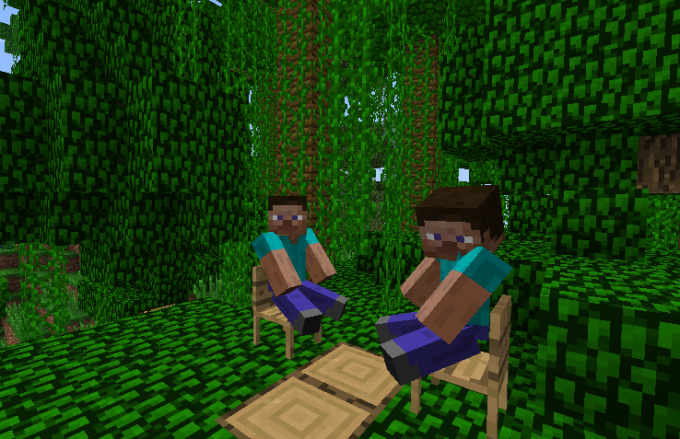 Some players are big introverts, and even favorite Minecraft prefer to learn alone. They don't need any company – they all used to exercise himself and to rely solely on yourself. However, not everyone is so "stand-offish". Many in all endeavors need the company - including in the development of virtual subsoil and construction in the gaming space buildings. Of course, as friends can sometimes be regarded some domesticated animals, especially the wolf and the ocelot, becoming, respectively, a dog and a cat. Many give birth to as Pets and small slugs - the ones programmed to relentlessly follow the player, and even push the trolley when he's sitting in it. However, domestic animals in terms of intelligence is still far behind from people. With representatives of the human race and the word-others can be spread, and a joint strategy for the fight against evil to develop, and construction of some common efforts to build. In addition, many maps are designed so that they are better to play with someone for a couple. What about those who have company in the form of other gamers there? Fortunately, in this game there is an option (though only available in version 1.4.2), which allows to create a virtual friend. This is done in several different ways, and in one case even no additional plugins are required. Of course, your own PAL will not be like the mythical Karlsson living on the roof (especially since propeller in Minecraft special mod needed). The skeleton and zombies have a significant disadvantage - they burn in the sunlight. However, paradoxically, created on their basis friend will be quite resistant to the daily star. It will look like a normal character gamers, but it is made on the basis of a skeleton or zombie (the first one, however, is preferable). For starters it is better to switch to creative mode that appeared in the inventory of the eggs by the summoning of various mobs. Then build from solid blocks (e.g. stone) on a flat stretch of wall in two or three of the cube height and with an area of approximately five by five squares. You need to throw a different sword and armor, except the helmet, instead it will go to a standard head "miner" (it will also appear in the inventory in creative mode). After completing these preparations, you need to switch on the night (this is done in the menu) and use the egg to call in the above enclosed space of the skeleton, and preferably several, so surely at least one of them transformed into the other by gameplay. Such will happen when the mob pick up and put on the armor and the head-helmet. After such transformation it will become to ferret out the person who created the gamer. However, such a man can hardly be considered a full-fledged companion in the gameplay. His power will help you to perform various tasks in Minecraft (including battles), but normal communications with him will not work. Because it is better to use a special mod, thanks to which gamers will really get the virtual companion in the game. One of the most famous modifications of this kind - Friend Mod. In order to mod on the creation of other earned, it is necessary after downloading of any resource specializing in plugins for Minecraft, install into the mods folder in the "Minecraft forge". The files the installer just copied there. Here the coveted friend will appear almost immediately after you set the above fashion. And it may be a creature both male and female. However, this option is at the discretion of the gamer, as well as a number of other parameters that will govern the life of his virtual friend. The player can determine the special teams the name of the other phrases that he would speak in different situations of gameplay (when you're hungry, close to death, during a meal, in battle, etc. ), basic level of health, skin, respawn time and other attitudes. Gamers will have access to inventory buddy - press U - to make the desired changes. A virtual friend that will fight on the side of its Creator-player in all battles with the evil monsters, it is better to equip the most durable armor (ideally diamond) and occasionally give him food he will eat as soon as hungry. Also, the gamer can supply him with weapons - with the need to mate was from him at a fairly close range. In any case, so another game will be fun.